Have you ever wanted to visit an alien planet and make friends with some cute alien creatures? Farlands might be your jam. It’s a neat Oculus Rift exclusive that takes a little Pokémon Snap and a little Animal Crossing and puts it all in virtual reality. What it is: Farlands is one of the prettiest Oculus games I’ve played, and it’s really grown on me over the last week. You play as a research cadet tasked with exploring an alien planet and documenting its plant and animal life. The game is synced to the real-world clock, meaning that things change every day and sometimes there’s nothing to do but wait and come back tomorrow. I’ve been getting to know the aliens on the first two regions of the world and have even named a couple, which makes it much more fun to interact with them and photograph their new behaviors. 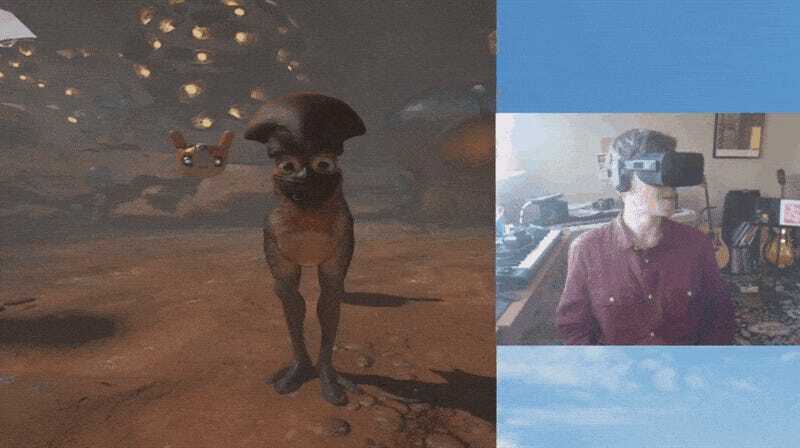 While it only partially comes across in the video, Farlands is a great showcase for the Oculus tech and feels optimized for VR in a way that underlines just how much better it is when a game is designed specifically for virtual reality. In the video above, some surprising stuff happens when I’m hanging out with my alien buddy Wilson, and that kind of surprise is what makes the game so cool. Farlands is a free pack-in with the Rift, which is also nice. Throughout the week (and probably into next week), I’ll be posting a series of short videos like this one to give an idea of how these VR games work. For more thoughts on the Oculus Rift itself, check out my full write-up.